Many people are familiar with what dispatchers do, but not everyone is familiar with the technology and resources we use to perform our required duties. Here is a short explanation of what you can find in the Smithfield Police Department dispatch area. 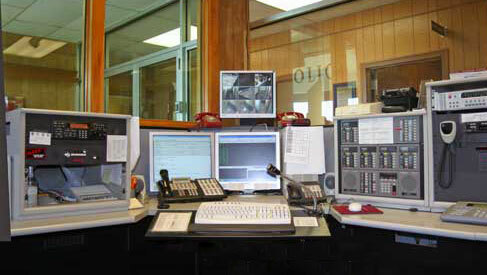 The Dispatchers of the Smithfield Police Department work in what is known as the Front Communications Center, an office located at the entrance to the police station. This office is the link between the department and the general public. All emergency, non-emergency and informational telephone and walk-in calls are received in this office and either redirected to the correct department or answered with a police response. The department has several business telephone lines and 9-1-1 dedicated lines that all ring in this office. The Front Communications Center also utilizes an advanced radio system. Our main radio frequency is used to communicate with the Smithfield Fire, Public Works, and Emergency Management Departments. We also monitor the RISPERN statewide radio system at all times. I’m going on vacation. Will the police check my residence while I’m away? The Smithfield Police Department does provide house check service. Simply call the police station at 231-2500 and request that your residence be place on the house check list. The dispatcher will request your name, address, telephone number, dates that you will be away and the name and number of an emergency contact while you are away. The house is then checked frequently by the patrol division until you return. Upon your return, you are asked to contact the police station and we will verify that you have returned and remove your residence from the house check list. When do Parking Bans go into effect during the winter months? The Smithfield Department of Public Works notifies the Smithfield Police Department when a temporary parking ban needs to be implemented for snow removal purposes. If you are unsure whether a ban is in effect you can call the Smithfield Police station at 231-2500 or tune into AM Radio WHJJ (920) or WPRO (630), or television stations WJAR 10, WPRI 12, and ABC6. Parking bans are also announced here on our website, on our Facebook & Twitter accounts and on the Town’s Emergency Information page. During parking bans, it is unlawful to park on any town roads. Doing so could result in a $25 fine and/or the towing of your vehicle. Essentially, parking bans automatically activate when snow and ice control operations are in effect.